It was a reunion that meant the world to the family of Stuart Cline. 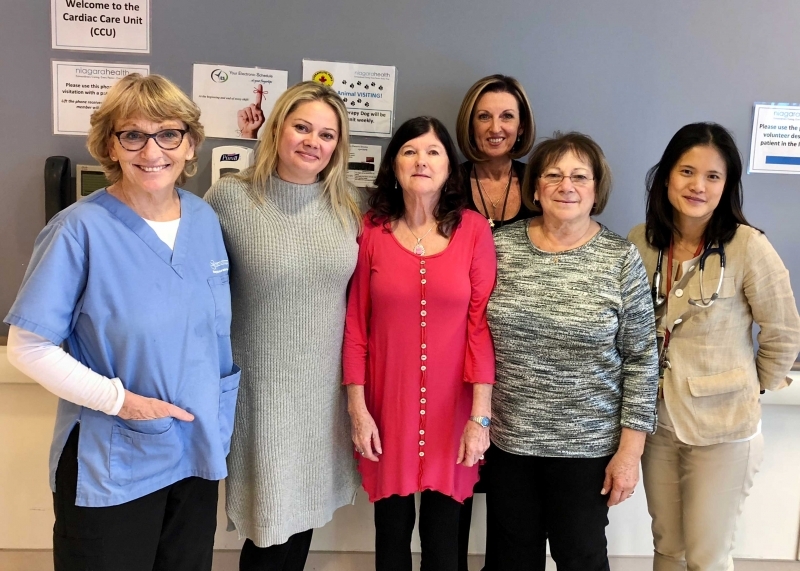 During a recent visit to Niagara Health’s St. Catharines Site, his family was reunited with some members of the Intensive Care Unit (ICU) team who had cared for Stuart in his final days. 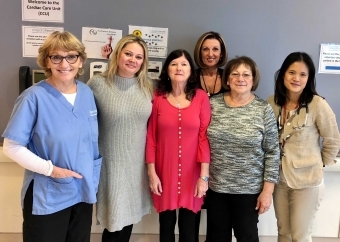 Stuart’s wife, Maria, his daughter, Lissa, and Maria’s sister-in-law, Jennifer, met with ICU Manager Elayn Young, Dr. Jennifer Tsang and Registered Nurse Debbie Wiecha. "The staff treated him with such dignity and they were so kind," says Lissa. "They were so good to him and to our family." Last winter, Stuart, 70, suffered a serious brain injury after he fell while on vacation in Mexico. He was brought back to Canada, where his family and friends were able to say goodbye at the St. Catharines hospital. The family returned to the hospital to reflect on their experience with the Three Wishes Program. The ICU team introduced the program to Niagara about a year ago as a way to personalize end-of-life care. Patients and their loved ones are encouraged to let staff know what would help provide comfort through their journey. The team makes their wishes come true, recognizing how important small moments are within the big picture of care. Family meant everything to Stuart, so the ICU team designated a special family room for the Clines. Family and friends could gather in the room, and the team provided coffee, tea, snacks and pillows and blankets. "It was welcoming and comforting to have that. In the midst of everything else, someone was thinking about us," says Maria. "Family meant the most to him." "We came and went as we pleased and our name was on the door," adds Lissa. "It was a home when you couldn’t be home. It was our home for three days." The ICU team also allowed as many family members and friends to be in Stuart's room as they wanted. The family told the staff how much Stuart loved music, so the team brought in a CD player and music for his room. "It's giving dignity to people who are going to die," she says of the Three Wishes Program. "I'm so appreciative of the compassion and care," adds Jennifer. "For them to treat us the way they did was beautiful." An ICU nurse also put a blanket that she had hand-knit on Stuart’s bed. "We still have that blanket. That’s how much it means to us to this day," says Lissa. "It is beyond special to us. The commitment and devotion of the staff is noticed. They went so far above and beyond. There was so much love." “We were delighted to have the opportunity to come back and reunite with the staff that made that hard time bearable,” she adds. “We would also like to thank everyone at the St Catharines hospital from the bottom of our hearts." The reunion also meant a lot to Dr. Jennifer Tsang, who cared for Stuart. "To me it means a lot to hear that a family or patient was moved by our care," he says. "It helps us to recognize our work is not forgotten. It’s very encouraging." "Part of the Three Wishes Program is not to focus on the tragedy of someone dying, but to celebrate life," she says. "We want to help families to remember the experience as a very humanized and compassionate experience." Dr. Benjamin Tam, an ICU physician, was instrumental in bringing the Three Wishes Program to Niagara Health. He learned of the program while working with the St. Joseph's Healthcare Hamilton ICU research team. The program, he says, is about better connecting healthcare providers with patients and family members. "It refocuses attention to the human aspect of healthcare," he says. "It's very motivating." Dr. Tam says he is moved by the support and comfort the program brings to patients and families during a very difficult time. "It's an opportunity to reflect on a person's life and shape a narrative that will be remembered by families moving forward."